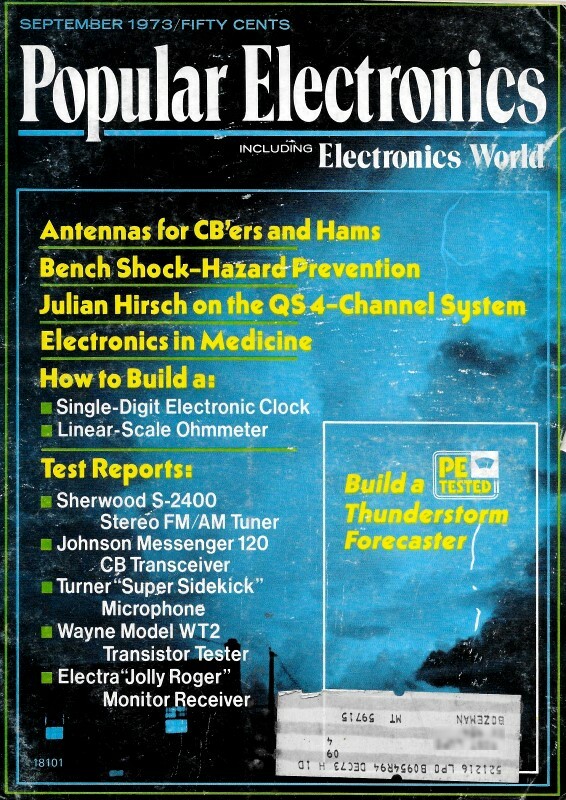 Mr. Lothar Stern, of Motorola Semi, published a 3-part series on transistor theory in Popular Electronics magazine in 1973. This is part 2. Part 1 introduced the basics of the bipolar transistor, and this follow-on article starts addressing transistor circuit configurations - common emitter, common gate, common collector, Darlington, differential - as well as presenting gain equations and delving a bit into the physical construction of the semiconductor elements. Here are Part 1, Part 2, and Part 3 (thanks to Jeff, KE5KQJ, for providing a copy of Part 3). By Lothar Stern, Motorola Semiconductor Products Inc. Fig. 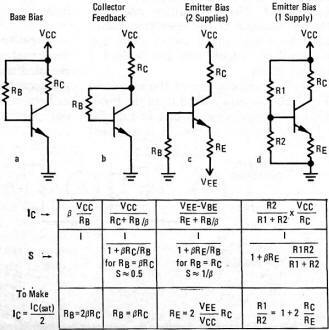 5 - Conventional common-emitter bias circuits. Table gives approximate characteristic expressions. Fig. 6 - Circuit of a typical common-emitter RC-coupled amplifier and its ac and dc loading curves. Fig. 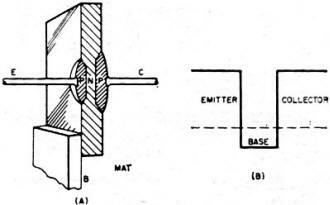 7 - Equivalent high-frequency common-emitter circuit (a) and its response (b). Fig. 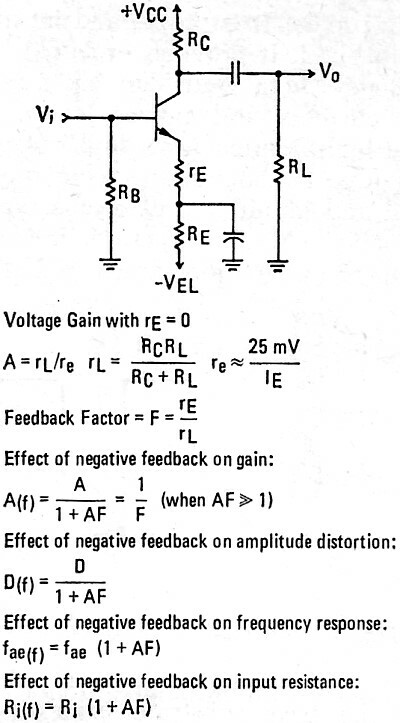 8 - One-stage amplifier and equations for feedback effects. Fig. 9 - Darlington transistor pair. Fig. 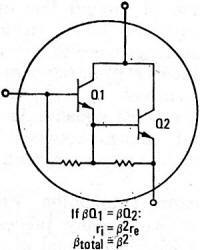 10 - Basic differential amplifier. Fig. 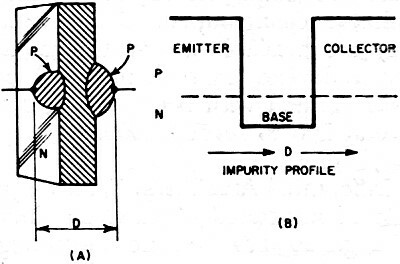 11 - Typical alloy transistor. Fig. 12 - The microalloy structure. Fig. 13 - Microalloy diffused type. Fig. 14 - Epitaxial mesa structure. Biasing. When operated as an amplifier, the transistor must first be biased to some quiescent value of collector current, so that both positive- and negative-going input voltage excursions will cause corresponding changes in output voltage and current. The ideal bias point is represented by Q on the loadline because this permits approximately equal excursions in IC and VCE in both directions along the load line without signal clipping. The bias point is established by a quiescent base current that results in a dc collector current of approximately IC(sat)/2. 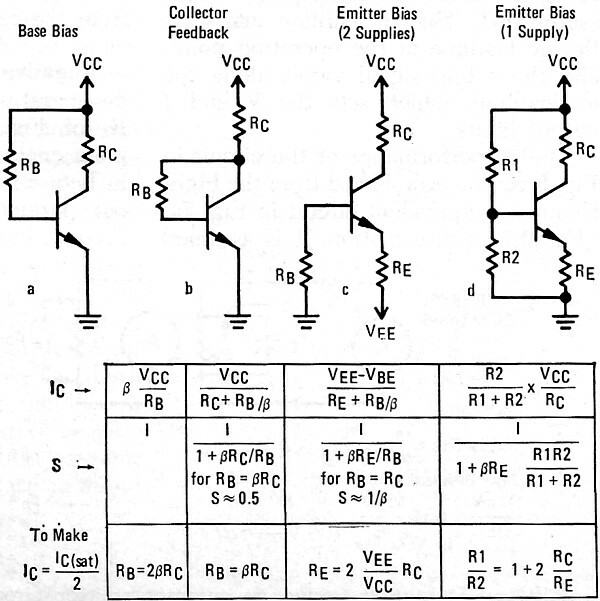 Several circuits are used for establishing the bias point. Among the most familiar are those in Fig. 5. The basic performance difference is in the bias-point stability. At point Q on the load line in Fig. 4, the transistor has a beta of approximately 20. If a transistor with a beta of 40 were substituted (simulated by dividing all IB values by 2), and if IB were held by the bias circuit to 2.5 mA, as before, the operating point would move up the load line to point Q', a much higher value of IC. As a result, considerable distortion would occur for high-value input signals. The bias point stability factor (S) is defined as the percent-change in IC, for a percent-change in β, or ΔIC/IC = SΔβ/β. If a percent-change of β causes a corresponding percent-change in IC, the least desirable condition, then S = 1. If IC is independent of β (corresponding to a zero change in IC when β is varied), then S = O. The formulas accompanying Fig. 5 give IC and S as functions of β and assign values for S under specific operating conditions. The bias arrangements in Fig. 5c and 5d using emitter degeneration are preferred because, by proper choice of resistor values, the effect of β on IC can be made almost negligible. This prescribes a large value of RE, so that the voltage, IERE, at the emitter is much larger than VBE or IBRB. 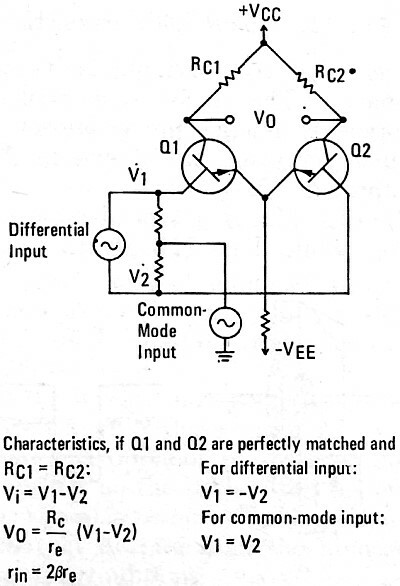 To prevent degenerative ac feedback, RE is normally bypassed by a large-value capacitor. 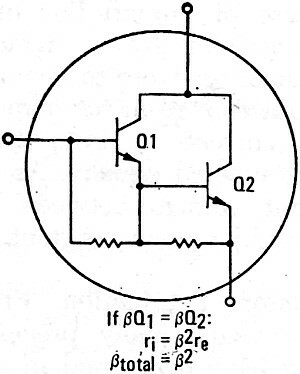 (Figure 5c is used when a positive and negative power supply is available. 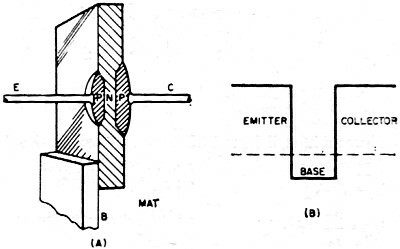 For single-supply operation, Fig. 5d is preferred. In practical transistor amplifiers (RC coupled amplifier, for example) the operating point is influenced by both dc and ac conditions. Figure 6 shows a typical RC-coupled amplifier and its representative loadline plot. Note that there are two loadlines - a dc loadline whose slope is affected only by the value of RC and an ac loadline whose slope is determined by rL, the equivalent resistance of RC and RL in parallel. The dc loadline represents the path along which the operating point can be established. The ac loadline intersects the dc loadline at the operating point, and the actual signal varies along the ac loadline, which sets the V and I output limits. Each transistor junction has an associated junction capacitance. These are quite small (on the order of a few picofarads), but they do affect transistor action at high frequencies. 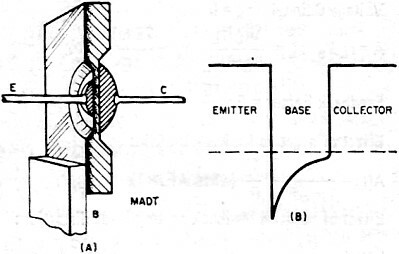 A typical transistor frequency response plot is shown in Fig. 7b. 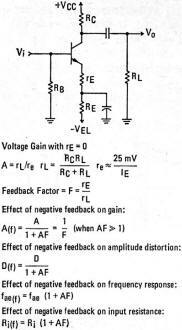 At the frequency where the reactance of the parasitic input capacitance equals the input resistance, βre, the current to the input resistance is bypassed through the capacitance to the point where the effective β is down 3 dB from its low-frequency value. This is called the β-cutoff frequency, fae. If the frequency is further increased, β continues to decrease at a rate of 6 dB per octave. The frequency at which β equals unity is specified on data sheets as fT, the current-gain/bandwidth product. Given fT, it is possible to determine transistor β for any frequency between fae and fT from the relation β = fT/f. Negative Feedback. While the dc degenerative feedback associated with RE of Fig. 6 stabilizes the operating point, making it independent of changes in beta and other temperature-dependent parameters, the bypass capacitor keeps it from compensating for the deleterious effects of these changes on the ac signal. Moreover, while proper placement of the operating point can reduce non-symmetrical signal clipping, it cannot reduce the distortion for large signal swings caused by nonlinearity of the ICIB, characteristics (Fig. 4). These characteristics can be greatly improved by means of negative signal feedback, which requires a small unbypassed resistor, rE, in series with RE as shown in Fig. 8. (This is only one of many possible feedback arrangements.) In addition, negative feedback improves frequency response and compensates for changes in output voltage (and gain) due to variations in temperature-sensitive parameters such as re, and βac. The equations accompanying Fig. 8 describe the basic advantages achieved through negative feedback, as well as the price paid for them in terms of voltage gain. However, since feedback increases input resistance, the loss of gain can partly be recovered because of an increase in the gain of a previous stage caused by the increase in input resistance. Darlington Transistors. Modern semiconduotor technology not only has led to complete circuits on a single chip of silicon (integrated circuits) but also to compound-connected transistors. For the circuit designer, the latter provides some cost and space savings, while still permitting unrestricted circuit design freedom. One of these devices is the Darlington pair shown in Fig. 9. Though consisting of two interconnected transistors, the device can actually be treated as a single transistor with extremely high current gain and input resistance. 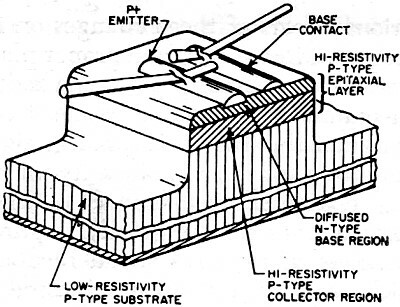 Normally, Darlington pairs are employed in the grounded collector configuration. Commercially, they are available as small-signal and power devices, in both npn and pnp polarities and with betas ranging from several 100 to several 1000. 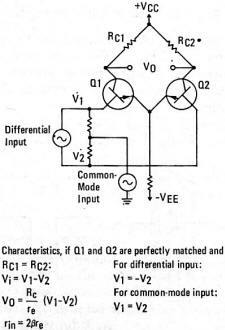 Differential Amplifiers. With the advent of integrated circuits, the circuit in Fig. 10 has become increasingly important. Being de coupled through a common emitter resistor, it has no low-frequency limit; but, unlike other types of dc-coupled amplifiers, it exhibits excellent stability and drift-free operation without requiring elaborate compensating circuitry. This is its most important characteristic. Operated in the differential mode, as shown, the output voltage responds only to difference inputs to the two bases. If a common-mode signal were applied (as in the case of ground line or power supply noise) or if the characteristics of the transistors were to change in response to a change in temperature, the collector current of both transistors would be affected equally. As a result, the output voltage between the collectors would remain constant. Over the years, many processes and structures have been used in transistor fabrication. Most of them are still being used, though the older processes no longer offer the best obtainable performance. The major sequential developments in the processing of the bipolar transistor are shown in Figs. 11 through 15. In Fig. 11A is a typical alloy transistor, while Fig. 11B shows its impurity profile. It is simple and inexpensive to build. It provides excellent low-frequency beta and can operate at high currents and power levels, but not at high frequencies or high voltages. Figure 12 shows the construction detail and impurity profile of a typical microalloy (MAT) structure. It is similar to the technique shown in Fig. 11 except that shallow pits are etched into the base substrate prior to collector and emitter alloying. The thinner base improves the frequency response but results in a fragile structure and further reduces breakdown voltage. The process shown in Fig. 13 uses diffusion of impurities into a thin base membrane prior to alloying to permit a closely controlled, graded impurity profile. This technique offers frequency responses up to 100 MHz. The process shown in Fig. 14, with extremely thin collector and base regions and unrestricted use of different material resistivities, provides high-frequency performance up to a gigahertz. It also provides high gain and high breakdown voltage. However, sensitive pn junctions are exposed to the atmosphere, resulting in high leakage current.